Whether you are setting up kitchen in your newly built house, renovating the old styled kitchen, setting up a commercial property like restaurant, café etc. or it is your best friend who needs your advice; you will probably be stuck at the choice between Quartz vs Granite countertops. – Natural Vs Man-made: Both Quartz vs Granite countertop materials are tremendous and made of natural elements; however, Quartz comes with a slight man-made effect. – Colours: Granite being all natural comes in specific colors only while Quartz is available in variety of colours giving you more choices to meet your dream theme for kitchen or bathroom. – Price: Prices of Quartz vs Granite countertops keep on changing periodically, but normally Granite has higher selling price than that of Quartz. Depending on the price shift/availability the prices may go opposite as well. – Maintenance: Both Granite and Quartz need same level of maintenance; granite needs more care than that of Quartz. – Durability: Both Granite and Quartz have longer lives; however, the life is subjected to complete periodic maintenance and cleanliness. 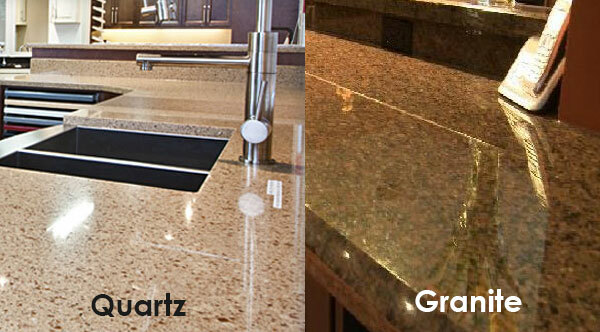 – Stain Resistance: Granite is said to be more vulnerable to stains, while Quartz is mostly stain resistant. – All those going to set up the kitchen and bathrooms or renovating the same must have a specific budget before going to buy the countertops. – Quartz is normally crafted with a controlled appearance and so can come in the exact colour, texture and pattern that you want. On part of granite, some manufacturers commercially dye it just to boost the sales, so be sure about the colour and texture. – Quartz combines 93% natural quartz stone with 7% resin binder and some colourant making it the hardest material, so if you are looking for durability, here is your answer. – For countertops that have contact with wine, should ideally go for Quartz as it doesn’t absorb and hence no chances of staining, while granite will absorb the spilled vine and will get stain for sure. – Whether it is Granite or marble, it will need sealing, while Quartz does not need sealing or other routine maintenance for keeping up the beauty and attractiveness, so you save lot of maintenance costs as well. Again the choice is yours. Let it be Quartz or Granite, decision is totally dependent on requirements and budget. Although Quartz may be a good option for most of the buyers, still some people care more about delicacy, exclusiveness and high standards of luxury which may be met only by granite! For A No Obligation Discussion. Call Us Today!